Bacardi Oakheart Spiced Rum is a popular Rum available from DrinkSupermarket.com in 70cl to buy online. Visit DrinkSupermarket.com for the best price for 70cl of Bacardi Oakheart Spiced Rum or compare prices on our other Rum products. Smooth and spiced spirit drink of superior rum with flavours and spice Bacardi Oakheart is a tribute to the legendary and modern day adventurer. It honours their core character of loyalty, bravery and determination. These timeless qualities, backed by over a century of Bacardi practice, are reflected in the robust feel of Oakheart; calm and spiced with just a auras of of smokiness. Where to buy Bacardi Oakheart Spiced Rum ? Bacardi Oakheart Spiced Rum Supermarkets & Stockists. 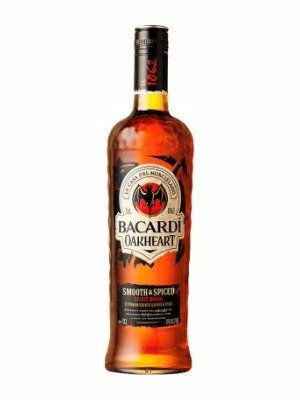 You can buy Bacardi Oakheart Spiced Rum online in most retailers and find it in the Rum aisle in supermarkets but we found the best deals online for Bacardi Oakheart Spiced Rum in DrinkSupermarket.com, TheDrinkShop, and others. Compare the current price of Bacardi Oakheart Spiced Rum in 70cl size in the table of offers below. Simply click on the button to order Bacardi Oakheart Spiced Rum online now.